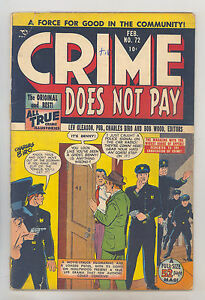 Crime Does Not Pay #66 VG+ 4.5 Lev Gleason Charles Biro 1947! US $0.60 shipping for each additional eligible item you buy from comic-warehouse. We offer and encourage combined-shipping. Please DO NOT pay for your purchases before receiving an invoice from us. This will SAVE YOU MONEY!